Getting this any time I have Vuze running. The multiple icons are not right-clickable, they are just... there. Can still open/close Vuze as normal using the first icon. This happens to me when I try to open a link in the browser and instead of using Vuze already running, open another. I'm still getting this problem and don't know what you mean by your answer. How do I get magnet links to only open in the already running Vuze program? Is there something I need to change? Please help it's really annoying! are you sure you are pasting the magnet link and not a link to the actual torrent file? The link you paste has to be the magnet link. If you click on the link and a dialog box opens asking where you want to save the file . . . that is not a magnet link. Personally I use magnet links less than 1% of the time so I can not be much more specific than that. That screen shot of your system tray icons made me laugh, as this just started happening to me too, just a few days ago when I upgraded to a 4K monitor. I don't believe the problem has anything to do with opening torrent files via browser downloads vs. magnet links. It's more likely something to do with Java and display interaction. I notice that more Vuze tray icons generate after I play a video game in full screen mode, and then return to the desktop. Perhaps the same is happening to you. I believe other actions generate more icons as well, such as "switching users" to the lock screen, and then signing back in. I'm not sure yet what exactly triggers it, as I've only seen the problem for a few days now. Attached is a screenshot of my system tray. no response from tech support?? Check in task manager to see if there are multiple Azureus.exe processes active - if there is more than one then it seems that something is causing them not to closedown/startup correctly - no idea what though. If there is only one then perhaps Vuze crashed and left an icon hanging about - for me mousing over them causes them to disappear in this case. 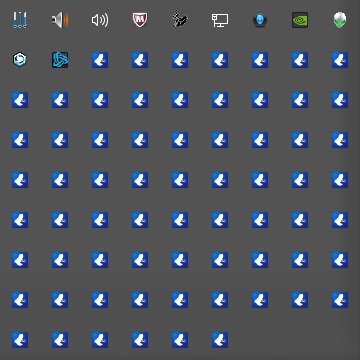 Well, this issue came back to occur to me, now whenever I connect my laptop to an HDMI output, the icons multiply.